Yasuko Tsuchikane received her BA at Gakushu-in University, Tokyo, in the history of Western and Japanese art, and proceeded to earn an MA in Western art history at Tufts University and a Ph.D. in Japanese art history at Columbia University, with minors in Chinese art history and the modern intellectual history of Japan. Her special interest lies in the investigation of how the coexistence of conflicting values in cultures, religions and ideologies in 20th century Japan and Asia at large induced collaborations among multiple social sectors that conditioned the production and patronage of art works in various media to legitimize specific values. 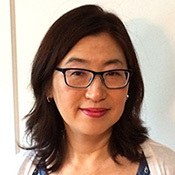 Selected publications resulting from her work include “Picasso as Other: Koyama Fujio and Polemics of Postwar Japanese Ceramics,” Review of Japanese Culture and Society, 2014, and “Rescuing Temples and Empowering Art: Naiki Jinzaburō and the Rise of Civic Initiatives in Meiji Kyoto,” in Kyoto Visual Culture in the Early Edo and Meiji Periods: The Arts of Reinvention (Routledge, 2016). Between the fall of 2015 through the spring of 2016, she was a fellow at the Sainsbury Institute for the Study of Japanese Arts and Cultures in Norwich, UK, to develop a book manuscript about the patron networks of 20th century Japanese architectural paintings for Buddhist temples.